Fourteen civilians died and another 30 were injured in Baghdad when a shopping area was hit during an air raid by US-led coalition forces, the Iraqi authorities say. The BBC's Andrew Gilligan, at the scene in the northern Shaab district of the city, says it appears that two missiles hit a busy parade of shops, several hundred metres from any military buildings. An angry crowd of several hundred people gathered in the area following the strike, waving the shoes and clothes of victims. 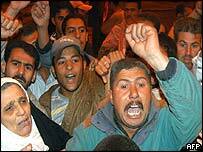 They shouted: "Down with Bush" and "Long live Saddam". Our correspondent says the buildings have been burnt out and their contents scattered over a wide area, while several cars were set on fire. Television pictures have shown a large crater in the middle of a street, and bodies wrapped in plastic sheeting lying in the back of a truck. Without directly admitting responsibility for the attack, a US military spokesman said coalition aircraft had attacked missiles and launchers in a residential area of Baghdad at around the time of the explosion. The missiles were positioned less than 100 metres from homes, the spokesman was quoted as saying. But correspondents say the incident, if confirmed as a coalition attack, is a blow to attempts by the US-led forces to minimise civilian casualties during their drive to unseat Iraqi leader Saddam Hussein. Coalition warplanes attack Iraqi positions in northern Iraq, apparently as part of efforts to open up a limited second front. "It's impossible to say what could have been a military target in this area"
"War is not risk free"
Can Allawi heal Iraq's wounds?